The Fur Elise Nightstands are elegant and beautiful! Each stand is handcrafted by highly skilled Amish wood-workers from a variety of stunning solid hardwoods. The Fur Elise Collection features the finest, most exquisite Amish bedroom furniture. The 28" Nightstand offers an additional 4" to its sister nightstand in the collection, which gives you more space for alarm clock, lamp, and reading materials or photographs. The Amish Fur Elise Nightstand comes standard with full extension side mount slides. When your tired you want things to operate smoothly; rest assured these nightstands will! Furthermore, ask one of our Amish furniture specialists about our full extension undermount smooth-motion soft close slides and our aromatic cedar bottoms in drawers! The Fur Elise Bedroom is one-of-a-kind. Solid hardwood insets laced with intricately trilled moldings with pillars and epistals of like workmanship. Crowned with entablatures a full 3/4" thick. Deep-seated drawers are standard with concealed, fully extending ball-bearing slides. We have photographed the Fur Elise in Cherry wood with Brandywine Glaze and Washington Stain but we'll make Fur Elise your flavor with over 20 different standard stain colors and a handful of glazes, paints and distresses we have available. Choose from Edison, Vintage Illusion, or Modern hardware to complement your finish choice. Call us today with any questions on our elegant Fur Elise Collection at 1-866-272-6773. We have Amish Furniture Specialists waiting to help you. The Quality of our products is only matched by the quality of our customer service. Fur Elise - the bedroom you'll want to come home to. I love love love my bedroom furniture! Sure is beautiful stain on good hardwood maple. Thanks for your attention given to me while shopping. It was a pleasure. Please thank the wood makers for the custom work. 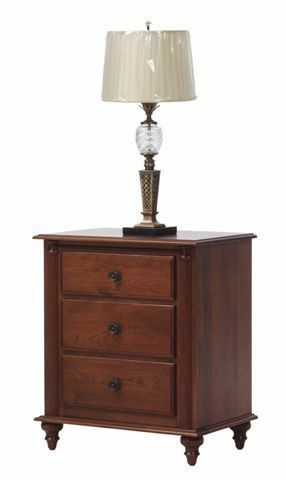 (Item 6591) Amish Fur Elise Night Stand 28"